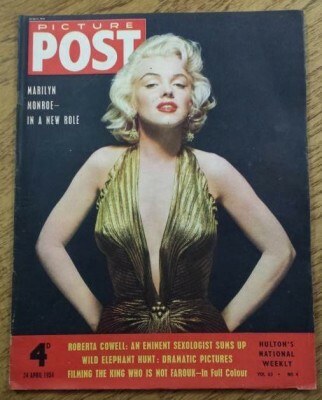 The Picture Post carried many pictures and features of Marilyn Monroe over the years including this classic Marilyn Monroe image in the April 24 1954 issue. In perfect condition the magazine has a value of up to £100 / $150. Most issues have minor flaws such as creases, rusted staples etc and the price decreases accordingly. Marilyn Monroe Picture Post 24 April 1954 £40 to £100.